Playing soccer ties families together as schedules, vacations and family time are coordinated. Family makes the sport we love even better as we share our trials and special moments with them. Whether it's running through a victory tunnel made of your family after the game or embracing your parents after a hard loss, our families are always there to share the moment. Take some time this week to kick around the ball or attend a game with your family and make sure to thank your mom, dad and siblings for all the car-rides, orange slices, signs, support, hugs, tears etc. Thank you, families, for sharing our moments with us and making the sport that we love possible! 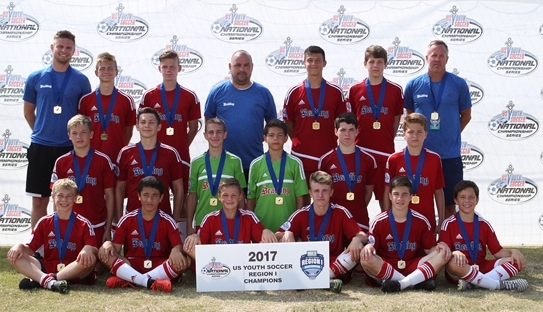 As head coach for 14U Boys Beadling 2003 (PA-W), Rob Fabean led the team to the 2017 US Youth Soccer National Championship final match in Frisco, Texas. Despite losing 2-1, Rob saw the event as a great experience especially since he was able to coach his son, Mason, along the way. Rob discusses his thoughts on family from the perspective of a father as well as a coach. What roles do families play in their children's soccer lives? Families play the most important role in Children’s soccer lives. The commitment and sacrifices that families make both from a time and financial perspective is what enables so many children to experience this great game. They don’t get thanked enough for all that they do. As a coach, I am grateful for the families of the players I coach. They go above and beyond making sure their son/daughter is at trainings, tournaments and any other team activity that we may do. You play a special role in your son's life as his coach. How is this different or the same from being a parent on the sideline? Coaching my own son is special in many ways. Most importantly from a parental perspective, I get to spend valuable time with him while he is doing something that he absolutely loves. From a coaching perspective, I get to be a part of his growth as a player. From both sides of the fence it is fulfilling to watch him and his team achieve so many great things already. What was it like to experience the National Championships with your family? Well, I wish we would have won the National Championship, but we lost 2-1. In any case it was such a great opportunity to not only make it to the National Championship event, but to coach in the National Championship game with the group of boys we have and to have the support of all of their families was an unbelievable experience. My wife and daughter were able to be there supporting us, so that was all the more special. What are some of your favorite memories with your family on and off the field? There are so many. To name a few, obviously the National Championship game from this past July is hard to top. All of the road trips to tournaments over the last 10 years with my daughter who is now a senior in college and now with my son were all special. Just getting to spend that time with them, watching them do something that was special to them, made all of the time invested and money spent well worth it. What are some different ways that families can bond through soccer? I’ve watched over the years, not only the players on my teams become such good friends, but also the parents. The amount of time that is spent together, you have a choice to make, either develop friendships with each other (preferred) or go a different route. From an individual family perspective, it’s a great opportunity for families to spend a lot of time together, meeting new people and seeing new places. What advice would you give to soccer families? Enjoy the time that you have watching your children play. Be supportive of them and their teams. The time will go way faster than you would ever expect it to, so make the most of every second that you have with your children while they are playing the sport they love. The memories you will make will be life lasting.